Against all odds (some may say against all logic), vinyl records have made a remarkable comeback in recent years. What was once considered a dead medium has arisen to reclaim a prominent place in high end audio. While the reasons behind this resurgence are likely many and varied, it's safe to say that convenience is definitely not one of them. As beguiling as the sound of a really good analog recording may be, there's no question that to fully appreciate vinyl playback in all its glory, a special degree of commitment is required from the listener. It can take hours to set up a good high end turntable system properly, and that's just half the battle. 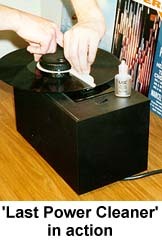 Even if the tracking force, azimuth, anti-skate, and vertical tracking angle are set perfectly (no mean feat), performance will still be compromised if the stylus has to fight through an accumulation of dirt, dust, and other assorted contaminants before it finds the information contained in the grooves of the record. While most would agree that these foreign substances should be removed to achieve optimum playback and to preserve the life of the record itself, the debate rages on as to how best to accomplish this goal. If you ask 10 different vinyl aficionados about the best way to clean a record, you're likely to get ten wildly different responses. Some of the "alchemaniacal" persuasion spend hours mixing elaborate cleansing formulas containing everything from photographic chemicals to Dawn dishwashing liquid. Others meticulously clean the same record over and over again on wet-vac record cleaning machines until it sounds just right. Still others claim all that is necessary is the trusty Decca record cleaning brush. Cleaning records using many of these approaches can be time consuming and expensive. However, for those not interested in tracking down obscure cleaning chemicals or investing hundreds of dollars in a record cleaning machine, alternatives do exist. After a long absence, Allsop has just brought its fabled Orbitrac Record Cleaning System back to market, providing a quick, effective, and inexpensive approach to this necessary aspect of proper vinyl playback. Allsop's Orbitrac 2 Record Cleaning System, currently available from the manufacturer and select dealers, offers an elementary yet remarkably effective "all in one" approach to the record cleaning process. The Orbitrac 2 kit, housed in a convenient plastic carrying case, contains the Orbitrac unit itself, two cleaning cartridges, two one-ounce bottles of cleaning fluid, a small, stiff-bristled brush for cleaning the cartridges, a "pivot pin", and a set of non-skid mats. 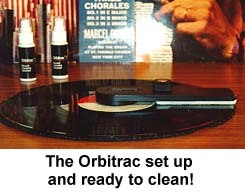 Cleaning records with the Orbitrac system is simplicity itself. The user simply places the dirty record on the non-skid pads, snaps a cleaning cartridge into the Orbitrac unit, and squirts some cleaning fluid on the cleaning pad attached to the bottom of the cartridge. Next, the Orbitrac unit is placed on the record by inserting the unit's pivot pin in the center hole of the record. The user then spins the Orbitrac unit 3-5 times in a clockwise direction around the record. The album is flipped over and the process is repeated. At the conclusion of each cleaning cycle, the user brushes all the accumulated dust, dirt, and grime from the cleaning pad with the stiff-bristled brush. The entire process takes no more than 30 seconds per record to complete. I did all of my listening on a Rega Planer 3 turntable with a Rega RB-300 tonearm and a Sumiko Blue Point Special cartridge. The rest of the system consisted of my usual NAD/Rotel/Cardas/Spendor setup. For comparison purposes, I also used a Record Doctor record cleaning machine, LAST's Power Cleaner for Records, Nitty Gritty Pure 2 Professional Record Cleaning Fluid, and Audio Advisor's Super Cleaner II fluid to clean all or part of certain test records. In considering how best to approach the review of a record-cleaning product, I started with a host of conceptual approaches. Follow the lead of the infamous vacuum cleaner salesman- you know, the guy in the department store who just dares you to grubby up his carpet sample- I was going to start with a clean record, dump a variety of substances on it, and see how effectively the Orbitrac cleaned it. Unfortunately, I just couldn't bring myself to intentionally soil any record, not even one by Mariah Carey (well, I may be willing to make an exception there). Further complicating this approach is the unknown origin of the "stuff" that eventually finds its way into the grooves of your favorite albums. I'm not sure if any scientific studies have been conducted to identify the likely nature of these substances, but I do know that you can't exactly go out and buy "Record Grime in a Bottle". Upon further consideration, I concluded that the best test of any record cleaning system would be to simply clean a wide variety of new and used records plucked from their natural habitats. To this end, I spent a long weekend buying vinyl from as many different sources as I could think of. I went to record stores, estate sales, thrift stores, and a record convention. I bought clean vinyl, dirty vinyl, old vinyl, new vinyl, imported vinyl, domestic vinyl, mono vinyl, stereo vinyl, and Polka vinyl. Armed with 27 or so "reference disks", I began the evaluation process. By their very nature, record cleaning products don't lend themselves to conventional testing methods. Once a record has been cleaned, you can't exactly put the dirt back on it and engage in extended A-B testing. The only practical solution to this dilemma was to keep a careful log of my visual and aural appraisal and impressions of the record's "before" (pre-cleaned) condition for comparison to the "after" (post-cleaned) results. More specifically, I started by conducting a visual inspection of each record, logging the degree of dust, grime, fingerprints, scratches, and other imperfections readily apparent in the vinyl. Next, at great peril to my Blue Point Special and even greater peril to the used records, I plopped the "unclean" lp onto the turntable and played randomly selected tracks, noting the degree of surface noise, ticks, and pops. The record was then cleaned, visually inspected, and replayed using the same test tracks. I noted the "after" effects from the cleaning and moved on to the next record. I cleaned the stylus between dirty and clean playings with LAST Stylus cleaner and, occasionally, "conditioned" it with LAST Stylast. The effectiveness of the Orbitrac Record Cleaning System became readily apparent with the very first test record which, I believe, was the Getz/Gilberto disk. My pre-cleaning notes reflect that this record appeared to be in average to slightly above-average condition. The surface contained a moderate degree of accumulated dirt and dust, but seemed unscratched and unmarred by fingerprints. Sonically, it performed as expected given its somewhat dusty appearance, with the expected ticks, crackles, and pops cropping up during the record's quieter passages. 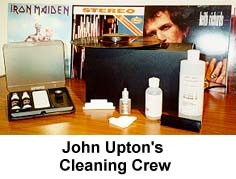 I then cleaned the record with the Orbitrac system, following the directions included with the kit. The Orbitrac pads lifted all of the visible dirt, dust, and grime from the grooves of this record, leaving it in what can only be described as "like new" condition. An inspection of the cleaning pad, now discolored with the dirty buildup previously clinging to the surface of this disk, confirmed the apparent effectiveness of the system. The proof, however, was in the listening. I was pleasantly surprised by the effectiveness of this relatively inexpensive record cleaning system. The amount of surface noise on the Getz/Gilberto disk after the Orbitrac treatment was markedly reduced from its previous levels. In addition, music emanating from the surface of this newly-scrubbed disk seemed to have more of a "you are there", three-dimensional palpability to it than previously noted. This sonic experience can perhaps best be likened to the difference between looking outside through a dirty window and then looking at the same scene through a clean one. The underlying view is the same whether the window is dirty or clean, but through the clean window, colors appear more vibrant, details become clearer, and the entire scene has a lifelike "sparkle" simply not present when looking through dirty glass. These general observations remained consistent with every disk cleaned with the Orbitrac system. Though the degree of improvement varied from record to record, I did not experience a single instance where the sound did not improve with the Orbitrac cleaning process. I had intentionally picked out a few really grimy records to test the limits of the Orbitrac's effectiveness, and, for the most part, the Orbitrac seemed up to the task. It swept decades of accumulated dust from the Mercurys and Living Stereos with ease, wiped away a horde of fingerprints from a severely mishandled Keith Richards disk, and eradicated the remains of a mold-like substance that appeared to have lived and died on Dave Brubek's Jazz Goes to College. The only problems that the Orbitrac seemed to have were with what were probably once sticky substances that over the years had encrusted on the surface of certain records. While the Orbitrac was able to reduce the size of these blemishes, it couldn't completely remove them, even after repeated cleanings. In the Orbitrac's defense, however, the only thing that seemed to remove these contaminants was an expensive combination of LAST's Power Record Cleaner, Nitty Gritty's Pure 2 Record Cleaning Fluid, and a few spins around on a Record Doctor vacuum-powered record cleaning machine. While I noticed improvement every time using the Orbitrac on used vinyl, my finding with brand new/still sealed records were less definitive. While none of the records sounded any worse after an Orbitrac treatment, I only noted actual sonic improvement on the Squirrel Nut Zippers album. The change was very subtle, as the vinyl was quiet right out of the package, but I did notice improvements in transparency and detail retrieval. On the other new records, I did not notice any meaningful change. Can the Orbitrac System match the performance of the much more expensive wet-vac record cleaning machines? I wondered the same thing myself, but encountered many of the same conceptual problems in formulating a viable comparison plan. Sure, I could clean a record with the Orbitrac, listen to it, clean it again with the Record Doctor/Nitty Gritty Pure 2 combination, and listen again for any improvements, but would this deliver meaningful results? I actually tried this approach on a number of disks and noted moderate yet nonetheless audible improvement after running the record through the Record Doctor system. I cannot, however, definitively say whether the improved sound, minor though it was, resulted from the Record Doctor removing contaminants that the Orbitrac couldn't handle or simply from the record being cleaned an additional time, regardless of the method used. In an effort to answer this question, I experimented with some unorthodox cleaning procedures to find meaningful sonic distinctions between the two approaches to cleaning records. With some lps, I cleaned one side with the Orbitrac and the other with the Record Doctor. On others, I used the Record Doctor first and then followed with an Orbitrac treatment. After dozens of record cleanings, all I can say is that both methods effectively remove the vast majority of contaminants found on your typical used record. I thought that the Record Doctor approach did a better job removing those gooey globules of "stuff" embedded in the grooves of certain records, but the results were much closer for ordinary surface dust and dirt. Ultimately, I found that the most satisfactory cleanings occurred when I used the Orbitrac System in conjunction with LAST Power Cleaner and the Record Doctor/Nitty Gritty Pure 2 combination. For those interested in exploring this multi-method approach, I highly recommend an article by Michael Wayne entitled "Zen and the Art of Record Cleaning Made Difficult", which can be found in Volume 1, Issue 3 of The Tracking Angle. Though the Orbitrac did exceed my expectations at what a non-vacuum record cleaning system was capable of, I do have some minor quibbles. The Orbitrac cleaning pads can get dirty very quickly, especially when cleaning unusually filthy records. While the stiff-bristled brush supplied with the kit can remove most contaminants from the pads, it does not get them all. I tried washing a particularly grimy pad with soap and water as the instruction sheet suggested, but it didn't completely recover its full effectiveness. Therefore, to prolong the life of these cleaning pads (replacements can be ordered from Allsop), I suggest "pre-cleaning" the record with a Hunt or Decca record cleaning brush. These brushes will remove a fair amount of loose dust and debris from the record, allowing the Orbitrac pads to deep clean the grooves without getting gunked up with a lot of surface grime. As an alternative approach to pre-cleaning, you can also wipe the surface of the record with a lint-free cotton pad (Allsop's CD wipes seem to work for me) doused with your favorite record cleaning fluid, making a "Stridex Pad" of sorts for your records. Prospective purchasers should also be aware that the Orbitrac System appears to be specifically designed to clean 12 inch albums only. Although I was able to clean the 10 inch Love Jones record set without too much difficulty, I could not figure out an effective way to use this product to clean 45s. Also, as the cleaning spray included in the Orbitrac kit is alcohol based, it should not be used on 78s. Finally, though a good cleaning will help you get the best possible sonic performance from your records, there are limits to what any system can accomplish. Just as a bottle of Windex and a roll of paper towels won't remove scratches, cracks, or other imperfections from a pane of glass, the Orbitrac, or any other record cleaning system for that matter, cannot eliminate noise caused by imperfections and scratches in the vinyl itself. In fact, when I first started cleaning records, I thought that the noises and pops caused by damage to the vinyl itself were actually louder following the cleaning process. After further listening, however, I concluded that the noise created by these imperfections remained essentially the same, they just seemed louder because the noise created by dirt, dust, on other contaminants was significantly reduced. In considering the value of any audio-related accessory, my criteria are simple. First, does the product enhance the listening experience? Second, does the degree of enhancement to that listening experience bear a reasonable relation to the cost of the accessory? If the answer to both of these questions is "yes", I can recommend it without reservation. The Orbitrac 2 Record Cleaning System, combining formidable record cleaning prowess with a comparatively bargain price, merits an unqualified endorsement. For those listening to vinyl records without vacuum-cleaning record machines, I consider the Orbitrac to be an indispensable accessory. Even for those with such machines, the Orbitrac system, used in conjunction with the vacuum-cleaning process, yields cleaning results beyond the abilities of either system individually. Buy an Orbitrac, clean your records, and listen to them with the confidence that you're hearing them at their best.